I had the pleasure of dining tonight at Primo Restaurant at the J W Marriott at the Grande Lakes Resort in Orlando, FL. I know what you might be thinking: a Marriott restaurant? Big deal. But, first remember that the J W Marriott is the flagship of the chain, and they are definitely more upscale. This restaurant is co-owned by Chef Melissa Kelly, a James Beard winner who graduated first in her class at the Culinary Institute in Hyde Park, and apprenticed at several forward thinking restaurants, like Chez Panisse in Berkeley. Her style is locavore, and she grows her own veggies wherever possible, cures meats, makes all pasta in-house, and is obviously committed to quality. The food shows the result! I started with an Amuse Bouche of Grouper Crostini. The breads are all housemade, carved from a large decorative bread station, proudly and out in full view, and served with a real good olive oil. My first course was Oyster Fritters, which maintained a fresh oyster taste with a lucious batter and a great aoili, garnished with fresh herbs. Melt in my mouth good. 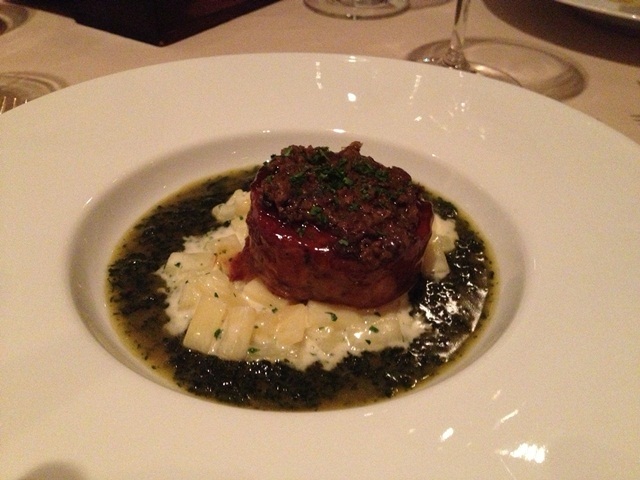 My next course was pork Saltimbocca, in a traditional sauce, over spinach. I subbed in gnocchi for the usual garlic mashed potatoes. This rivaled the best I'd remembered eating in Brooklyn or Little Italy in NY. The dessert choices were dazzling, including S'mores Two Ways, and Budino, but lately I've come to believe that any really good restaurant that makes its own donuts is compelling me to try them. These giant Zeppole were rich and satisfying. Just dusted with sugar – no fancy sauce needed. I’m staying here a week, so I have a feeling I might try this place again pretty soon! 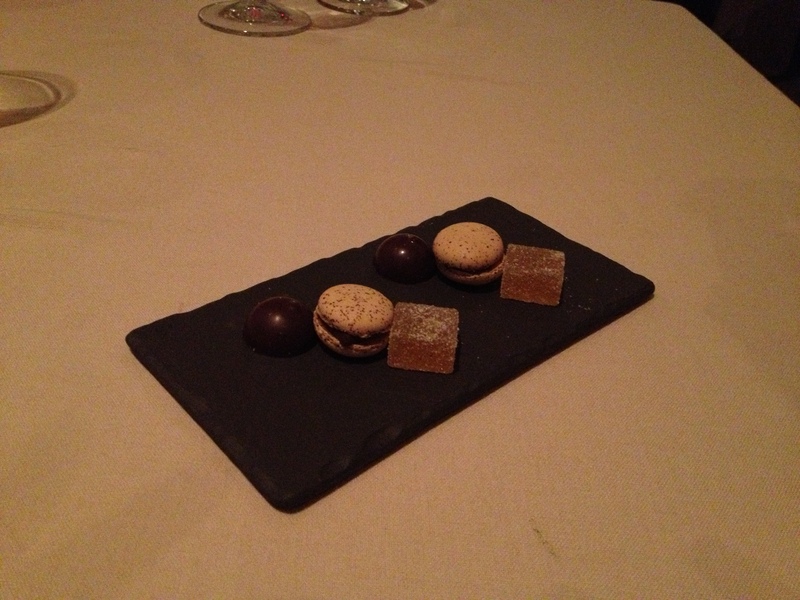 I had a world-class meal at CityZen in the Mandarin Oriental Hotel in Washington DC last week. 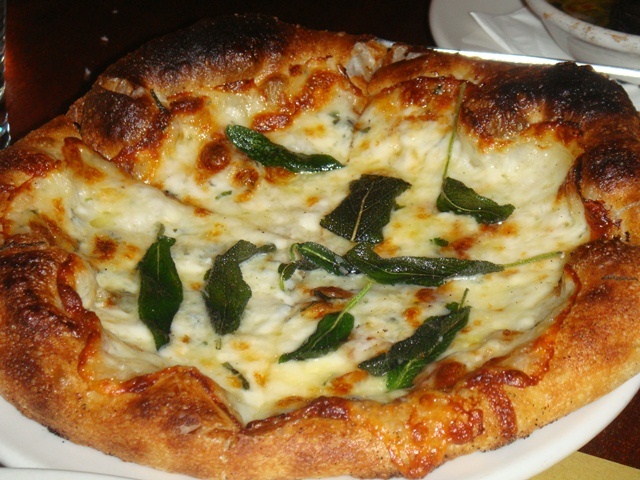 This restaurant is consistently in the top 10 for DC. 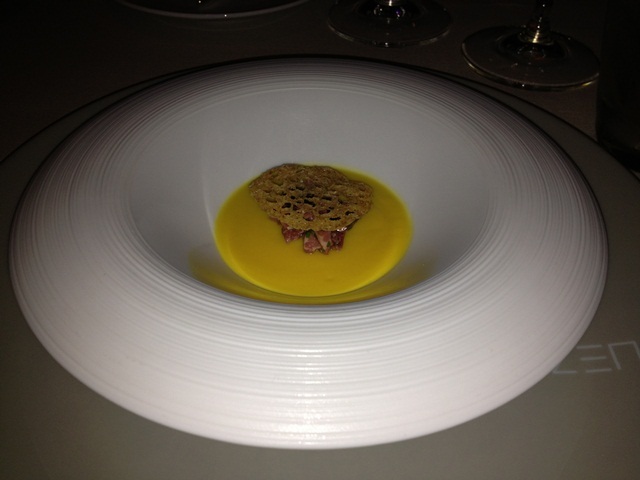 The chef is CIA trained, and has worked at Spago, French Laundry and PerSe. The menu is farm-to-table oriented, but with creative touches. 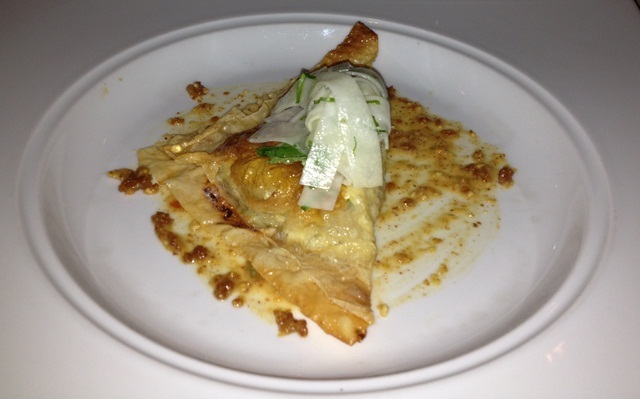 There is a set tasting menu and you can also choose four courses from a semi-ala-carte menu. 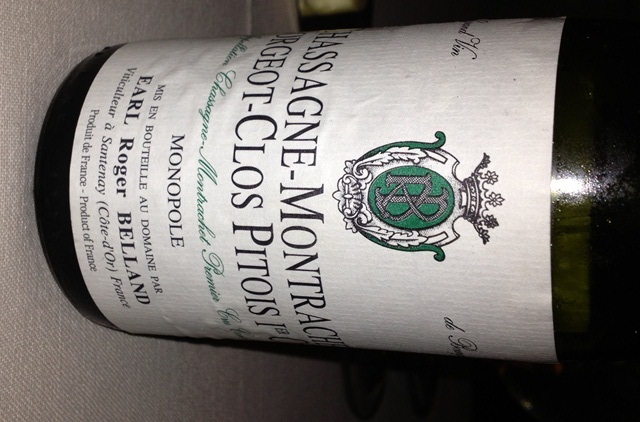 Excellent wine list. Great cocktails. Lovely ambiance. Wonderful service. I thought all the food had real clarity, great depth of flavor. Made my day. Highly recommended. 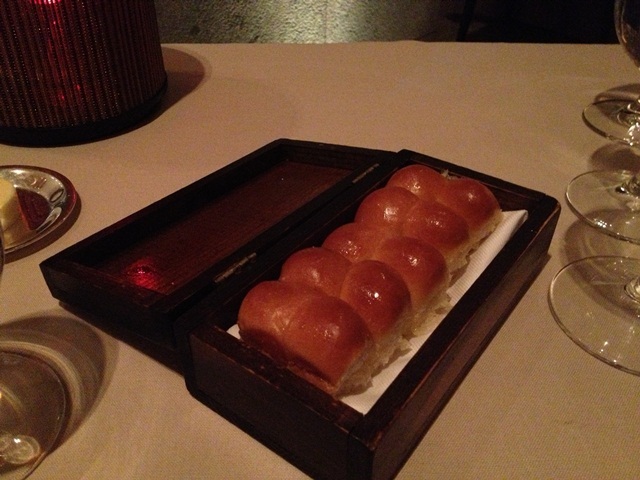 DELICIOUS Parker House Rolls! Melt in your mouth! I don’t usually write about private dinners, but Debbie and Jerry are such gracious hosts and we had such a lovely time there this weekend, that I wanted to thank them publicly. We were joined by another fun couple we both know, and had a lovely meal out on the patio with perfect weather, great food, great wine and great friends. Debbie had a tomato tart prepared for appetizers and a babaganoush with pita chips, and olives. Just right. 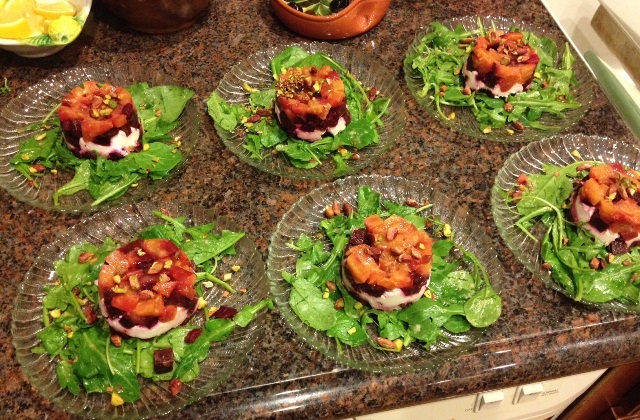 The first course was a roasted beet and goat cheese salad. We also had some warm sesame bread with gourmet olive oil for dipping. The salad was delicious, and I’m not even that huge a beet fan. We then enjoyed halibut with a tomato caper sauce that was juicy, tender and full of flavor. This was accompanied by a vermicelli/rice blend and green beans in a savory sauce. Dessert was mini cheesecake indulgences, a la Season’s 52, but I’d say Debbie’s were better. Now, we also drank a little. Some of us drank a lot. 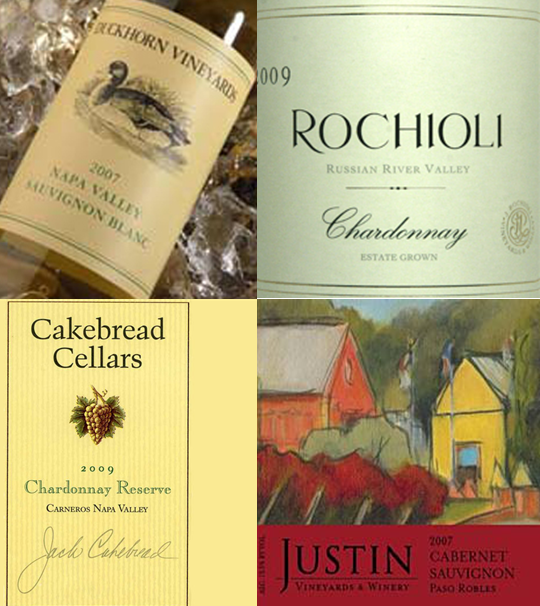 We enjoyed Duckhorn Sauvignon Blanc, Rochioli Chardonnay, Cakebread Chardonnay Reserve, and Justin Cabernet Sauvignon. Followed by Corvoisier, Remy, and Grand Marnier. An all together wonderful evening, made better by our hosts desire that everyone really have a wonderful time (as always!). Thanks D&J! 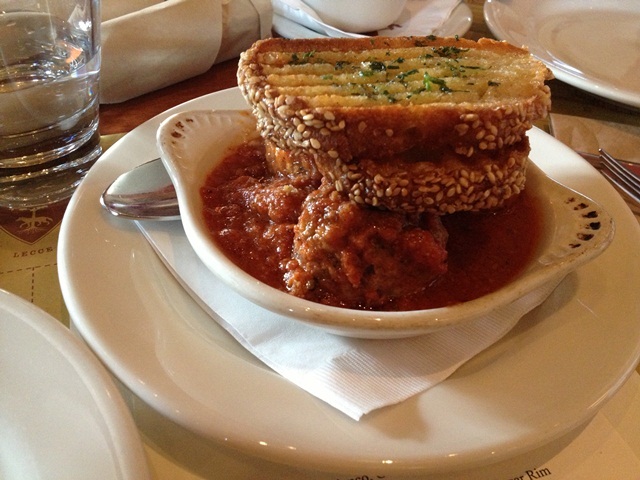 Lately we’ve really been enjoying the food at Lucca Café in Irvine. It is small, intimate, with a lovely patio, and the food is made with love. 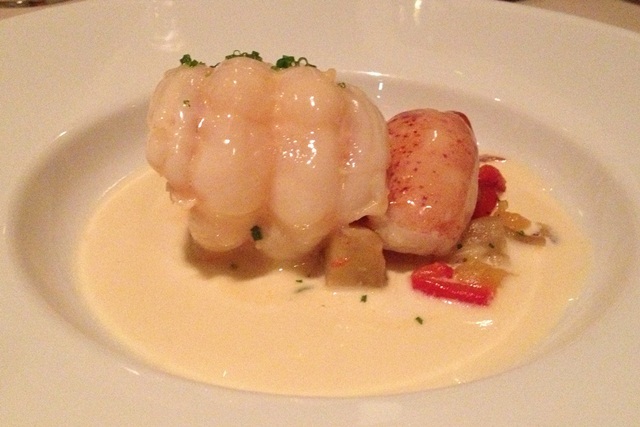 Chef Cathy creates wonderful dishes, with specials every week. Her husband Elliott loves combing the world for great wines, which Lucca sells at reasonable prices, with half-bottles, glasses and even half glasses and flights. 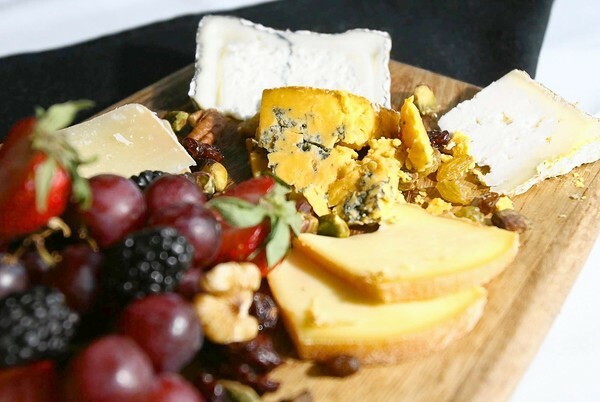 The cheeses change weekly, and many are not available in local stores. 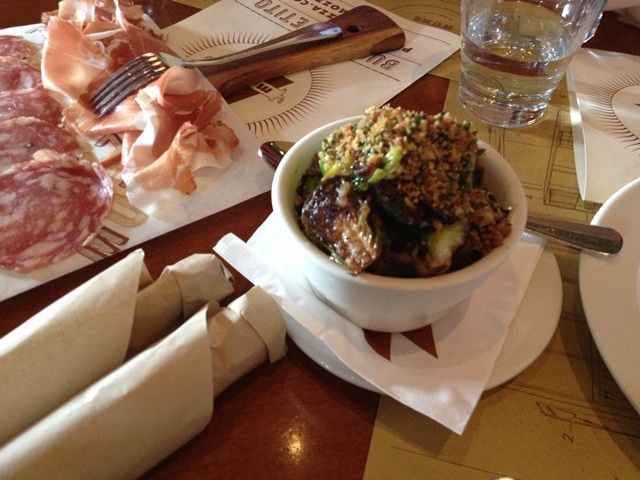 I’ve written in a previous post about Lucca’s small plates, which are wonderful. 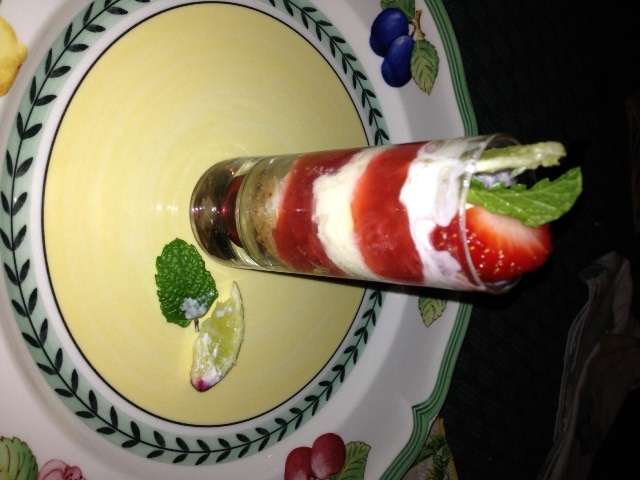 The desserts are also fabulous. 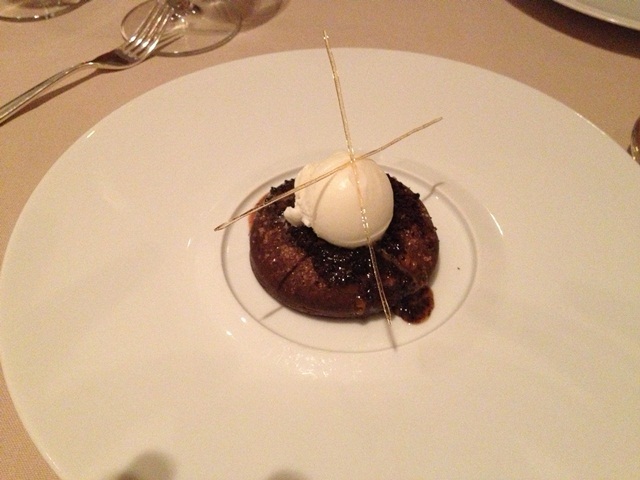 I recently had “Warm and Wicked” which is a decadent chocolate bread pudding. 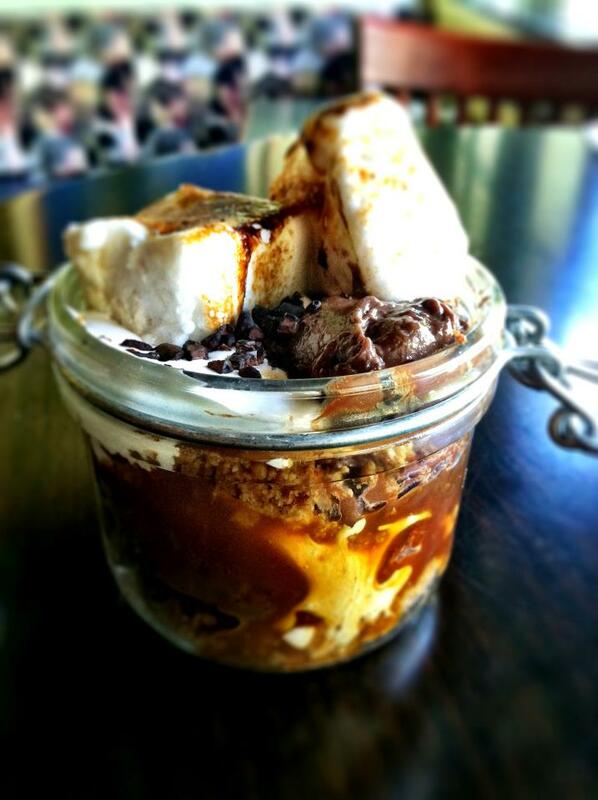 The S’mores in a jar shown above (in a martini glass at night) are a comfort food delight. In this week’s newsletter from Lucca, they reveal that their brownie recipe was in fact published last year in an LA Times article. 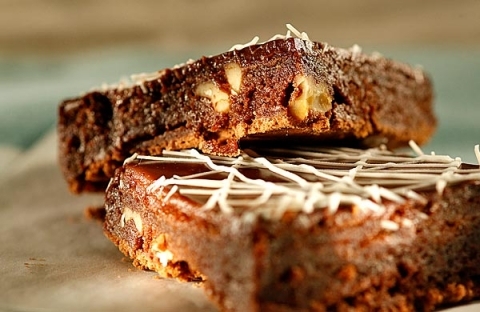 I have my own favorite brownie recipe, from Ghirardelli, but this looks really interesting, and I think I will give this one a try next time. Note: Adapted from Lucca Cafe in Irvine. Lucca uses Elite brand instant coffee. 1. Line 2 (9-inch) square baking pans with foil (I would use parchment paper), and grease the foil. Heat the oven to 350 degrees. 2. In a bowl set over a pot of simmering water, combine the bittersweet chocolate and butter, stirring frequently until melted and combined. Remove from heat and set aside. 3. In the bowl of a stand mixer fitted with the paddle attachment or in a large bowl using a hand mixer, beat the eggs, vanilla and almond extracts, coffee and sugar over high speed until combined and the mixture increases in volume (it will look almost like softened ice cream), 5 to 10 minutes, depending on the mixer. 4. Beat in the melted chocolate and butter over low speed just until combined. Add the flour and nuts and stir just until incorporated. 5. Pour the batter into the pans, dividing evenly between the 2 pans. Bake the brownies until barely set: A crust will form on top, and a toothpick inserted will be very gooey (though not wet like the batter), 20 to 25 minutes. 6. Remove the brownies and cool to room temperature, then refrigerate the brownies (still in the pans) for at least 6 hours to chill and fully set. 1. Place the bittersweet chocolate in a large bowl. 2. In a large saucepan, combine the cream, milk and butter and bring to a boil over high heat. Remove from heat. Pour the mixture over the chocolate and stir until the chocolate is melted and combined with the cream mixture, forming a ganache. 3. Remove the chilled brownies from the refrigerator, and invert the pans over a cooling rack set over a large rimmed baking sheet (the sheet will catch the excess ganache when it is poured over the brownies). Peel the foil liner away from the brownies. 4. Pour the ganache over the brownies, making sure it covers the tops of both batches (do not worry about the sides, as these will be trimmed when the brownies are cut). 5. Set the brownies aside to allow the ganache to cool and set. 6. Melt the white chocolate (place it in a glass container and heat it in the microwave, stirring every 30 seconds or so, until completely melted). Place the white chocolate in a piping bag, coronet or a sealable plastic bag (after the chocolate is added to the bag, trim one of the tips to the desired size to make a makeshift piping bag). 7. Streak the brownies with the white chocolate, then set them aside to give the white chocolate time to harden. 8. Trim the edges from the brownies, then cut the brownies into squares; each pan makes about 9 (3-inch) squares. Nutrition: each of 18 brownies: 574 calories; 6 grams protein; 66 grams carbohydrates; 2 grams fiber; 35 grams fat; 18 grams saturated fat; 107 mg cholesterol; 53 grams sugar; 162 mg sodium. PS: One of these days I really want to get to their Sunday Supper (monthly), served family style, at 3 pm. After a workout today, not only was I starving, but also craving BEEF. 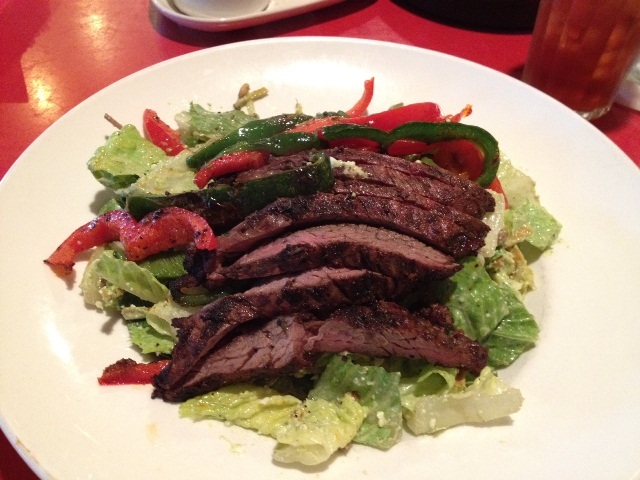 So I figured I could get a steak salad at El Torito Grill. They have a Fajitas Salad that is great! It starts with a salad mixed table-side that has romaine, sautéed pasilla chiles, bell peppers, onions, cotija cheese, jack cheese, fresh avocado, roasted fresh corn, and raspberry-tamarind vinaigrette. You can add Mesquite grilled chicken, skirt steak, or shrimp, which comes on a sizzling platter just like when you get fajitas. The server mixes up the salad, and adds the sizzling meat and veggies on top. Now for the best part. If you know El Torito Grill, you know that they have the best salad dressing on earth – the creamy cilantro pepita dressing. So sub that in for the the vinaigrette, and now you have steak salad perfection. The meat was tender and flavorful, the veggies seasoned perfectly, and my craving was totally satisfied.